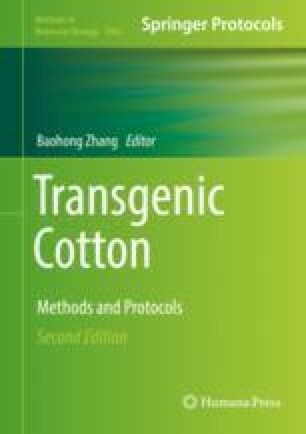 Although many gene transfer methods have been employed for successfully obtaining transgenic cotton, the major constraint in cotton improvement is the limitation of genotype because the majority of transgenic methods require plant regeneration from a single transformed cell which is limited by cotton tissue culture. Comparing with other plant species, it is difficult to induce plant regeneration from cotton; currently, only a limited number of cotton cultivars can be cultured for obtaining regenerated plants. Thus, developing a simple and genotype-independent genetic transformation method is particularly interested for cotton. In this chapter, we present a simple, cost-efficient, and genotype-independent cotton transformation method – pollen tube pathway-mediated transformation. This method uses pollen tube pathway to deliver transgene into cotton embryo sacs and then insert foreign genes into cotton genome. There are three major steps for pollen tube pathway-mediated genetic transformation, which include injection of foreign genes into pollen tube, integration of foreign genes into plant genome, and selection of transgenic plants.